Have you ever seen huge bells like this? 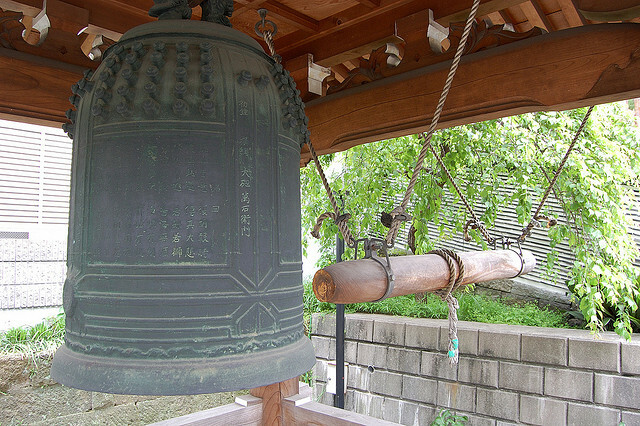 A typical bell seen at Japanese Buddhist temples. In Japan, each temple has a large bell, and we customarily ring it on new year’s eve. Actually, we start ringing the bell a little before midnight on new year’s eve, and we keep ringing the bell 108 times. It is called “joya no kane”. But why? It is not just to celebrate the upcoming new year. In Buddhism, it is believed that everyone has 108 evil passions called “bonnou”, and people ring the bell to get rid of these bonnou. I can’t recall each of the bonnnou, but let me tell you some of them. Typical bonnou are anger, doubt, ignorance, wickedness, and so on. Many temples allow for regular visitors to ring the bell. See this video. People take turns ringing the bell.